In a world where basic human rights are under attack and discrimination widespread, Advancing Equality reminds us of the critical role of constitutions in creating and protecting equal rights. Combining a comparative analysis of equal rights in the constitutions of all 193 countries with inspiring stories of activism and powerful court cases from around the globe, the book traces the trends in constitution drafting over the past half century, and examines how stronger protections against discrimination have transformed lives. 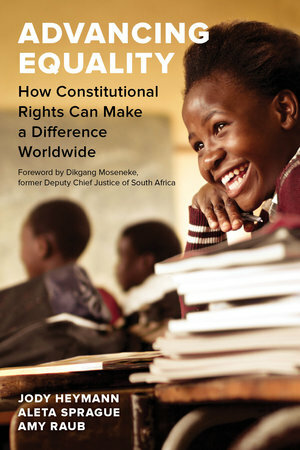 Looking at equal rights across gender, race and ethnicity, religion, sexual orientation and gender identity, disability, social class, and migration status, the authors uncover which groups are increasingly guaranteed equal rights in constitutions, whether these rights on paper have been translated into practice, and which nations lag behind. Serving as a comprehensive call to action for anyone who cares about their country’s future, Advancing Equality challenges us to remember how far we all still must go for equal rights for all. Jody Heymann is an elected member of the National Academy of Sciences, Distinguished Professor at the UCLA Luskin School of Public Affairs, Fielding School of Public Health, and Geffen School of Medicine, and Founding Director of the WORLD Policy Analysis Center. Aleta Sprague is Senior Legal Analyst at the WORLD Policy Analysis Center and an attorney licensed to practice in California and New York. Amy Raub is Principal Research Analyst at the WORLD Policy Analysis Center and an economist with over a decade of experience working on discrimination and inequality.